We have a master list of substrates. Some of these are suitable for some products while not for others. We want to have only those suitable for a product show in the drop down list on the Pricing Form. Cyrious's List Filter feature makes this possible. It can even be applied to Linked Lists, which can be distinguished by Product. Addtionally, some are no longer stocked or available. We want to exclude those from what is shown when the list is accessed. When a list is selected in a pricing_ch_18-pricing_forms of a given product, it shows only the rows or items which apply to that product. For example, we want to be able to take products we no longer stock out of the “shown” list but still have them accessible to older Estimates or Work Orders which used them. The solution is a Filter. With a Filter the item remains in the list but is not “shown” to the User. It remains available, however, in the list, and if a previous Estimate or Order is opened with a filtered selection, it will still appear and any pricing based on it will be honored. Additionally, filtered selections can still be viewed and accessed by opening the “New/Edit” command at the bottom of each list, if that permission has been enabled for the User Level. Add a Filter Column for each Product in which the list will appear and Name the Filter for that product. 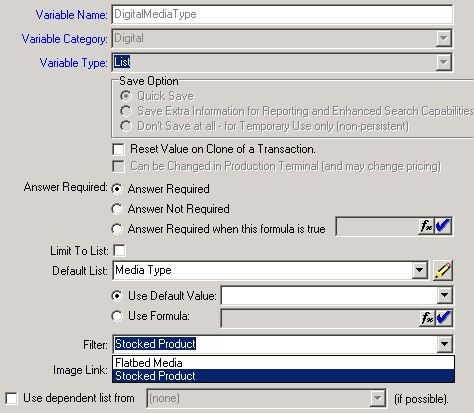 The Screen Shot below shows a list with two filters, one for Flatbed Media and one for Stocked Product. In the cfl_ch_5-variables List for each of the Products containing the list, locate the List Variable and Edit it. 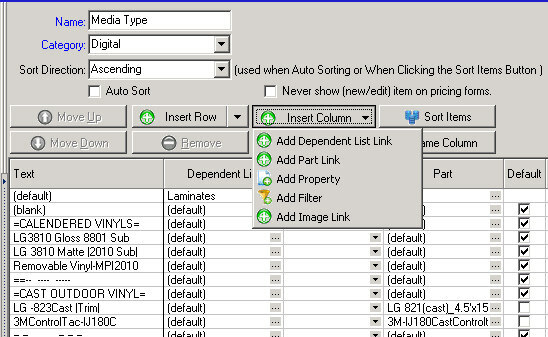 If you have selected a variable with a Default List which contains your filter, it will appear in the Filter drop-down selection as shown below. If you are working with a linked list, the Filter may not show up in the drop-down. If you write the name in manually, exactly as it is in the list, it will be honored when Cyrious selects that list. The Screen Shot below shows Filter Setup for a Variable. Locate the Filter Selection field and choose the Filter applicable to that Product. Save the Product and your Edits.